Open Studio weekend at APEC. With our lease ending in 2013 and our future therefore uncertain…. Roll up, Roll up! Could this be the last Open Studios at APEC? 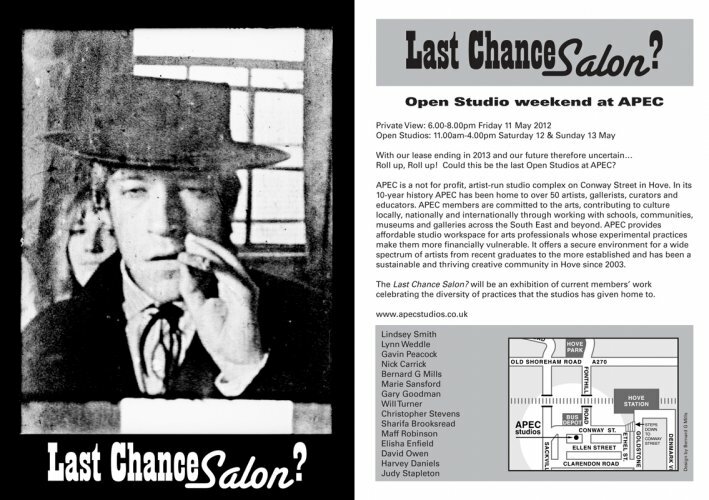 APEC is a not for profit, artist-run studio complex on Conway Street in Hove. In its 10-year history APEC has been home to over 50 artists, gallerists, curators and educators. APEC members are committed to the arts, contributing to culture locally, nationally and internationally through working with schools, communities, museums and galleries across the South East and beyond. APEC provides affordable studio workspace for arts-professionals whose experimental practices make them more financially vulnerable. It offers a secure environment for a wide spectrum of artists from recent graduates to the more established and has been a sustainable and thriving creative community in Hove since 2003. The Last Chance Salon will be an exhibition of current members’ work celebrating the diversity of practices that the studios has given home to. This entry was posted in Exhibitions on April 3, 2012 by Patrick Donohoe.